This is a great walk if you are short of time, it’s a 20 minute walk that starts off turning left from Mountain View Lodge or Kirkstone Lodge and heading thought the metal gate at the end of the road. This road is also part of the Badenoch Way which goes from Dalraddy to near Kingussie. 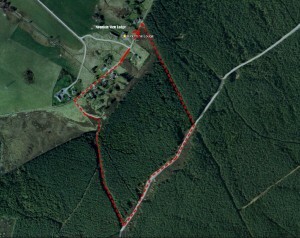 Once you go through the large gate you will see a smaller pedestrian gate on the right that takes you into the forest. Follow this until you come to the logging road, here you can carry on up the hill for a bigger circuit which takes about 1 hour, left takes you into Insh and also some lovely Lochs and a ridge which is worth doing. Turn right and follow the logging road for about 1/2 a mile. You will see a Cairn ( a mound of rough stones ), turn right here and follow the path until you come across another pedestrian gate. You are now back in Inveruglas, follow the road back through the hamlet to the cottages where you started. Simples! This walk is also fine for bikes to use, perfect if the kids can’t be bothered to walk.